The greenery is full and the lights are well placed and plentiful. The plug-ins allowed for end to end connection. I ordered 4 of these garlands from Overstock.com. The shipping boxes were sturdy and they arrived in perfect condition. I would highly recommend the Winchester Pine Garland with Clear Lights to my friends. This beautiful 9-foot garland features a Winchester pine design with vivid coloration and a natural aesthetic. 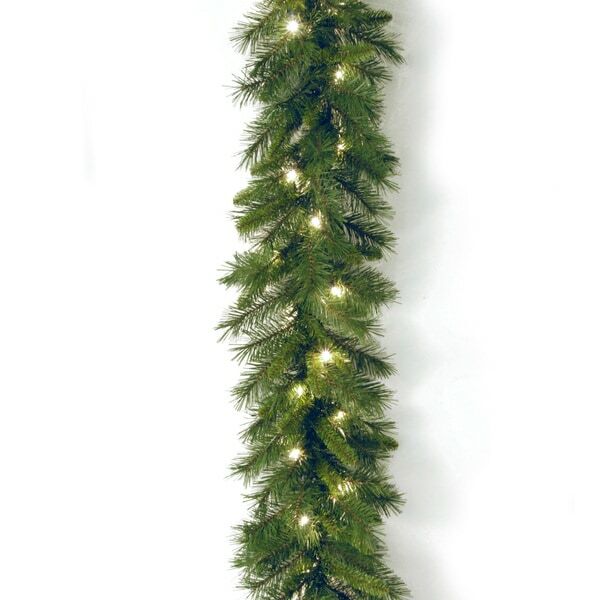 Pre-light with clear lights, this festive decorative garland comes ready to coordinate with any home or office decor. This was basically exactly what we wanted, particularly for our price range. It's not as nice as some of the other ones I've seen, but it also didn't cost over $100, so we're counting it as a win! The lights look nice and the pine is decent quality. It did need to be fluffed some, but that would be true of any garland. Overall, I'd buy it again and recommend it for anyone looking to decorate on a budget. First of all it sheds like crazy. You will have fake needles all over the place. It looks much better in the picture than it really is. I strongly recommend folks don't order this. It's a mess! This is a beautiful garland that looks very natural. It is the perfect length for my mantle. The lights are soft and not too bright. They definitely make the room look festive for the holidays. This garland looks great on my mantle easy to set up and great quality. Definitely recommend. This looks great fantastic up close, very high quality. Needles are well attached. Well priced. This garland is okay, the quality isn't the best I've seen, but not bad. I also was expecting it to be longer, which is my own mistake. It would be nicer if this item was battery operated. Seems overpriced for size and quality. This garland was perfect for my mantle. Hopefully, it will work just as well next year? This garland is ok, not as thick as shown, I should of gotten two of them to overlap then I think I would of gotten a more plush look. These were great value, they look lovely on my indoor staircase. I needed two strung together for the full stairs. They don’t scratch when you scrape against them, I was very pleased. because it look real and it's reasonable! No, these are incandescent lights on this garland. "When a bulb burns out do they all go out?" "Is the garland battery lit?" No, it is designed to be plugged in.